When I decried a dozen generations of dead-end urbanism recently, what exactly did I mean? Let me explain. A dozen generations is about how long it has taken us to move from the pre-industrial city of the 18th century to the post industrial city we find ourselves inhabiting today. And about how long it has taken us to conclude that we have ended up in a cul de sac. Backtracking is now clearly required. The post-industrial city, now to be found in every corner of the globe, is obsolete. An antidote is required. Quickly. Do city makers and city dwellers across the planet finally agree that their home places are obsolete? That infinite rapid growth based on access to infinitely available resources is still possible? That these places which spew out an endless toxic stream, that require more capital, more water, more energy, more food, and more resources than the planet has to offer are viable? That urban centers based on contemporary levels of consumption can actually continue to offer shelter to surging new populations? Hard to tell. In the developed world, it’s difficult to tell if city dwellers really see how much trouble lies ahead. We in the west are so wealthy, even now, and so comfortable with our patterns of urban life, that it’s hard to tell what it will take to induce changes in our urban intentions. In the developing world, with its much more stark contrasts between wealth and poverty, it would seem easier to perceive a need for radical change. But interestingly it is precisely these places that are expanding most rapidly, and expanding based on obsolete patterns and intentions. 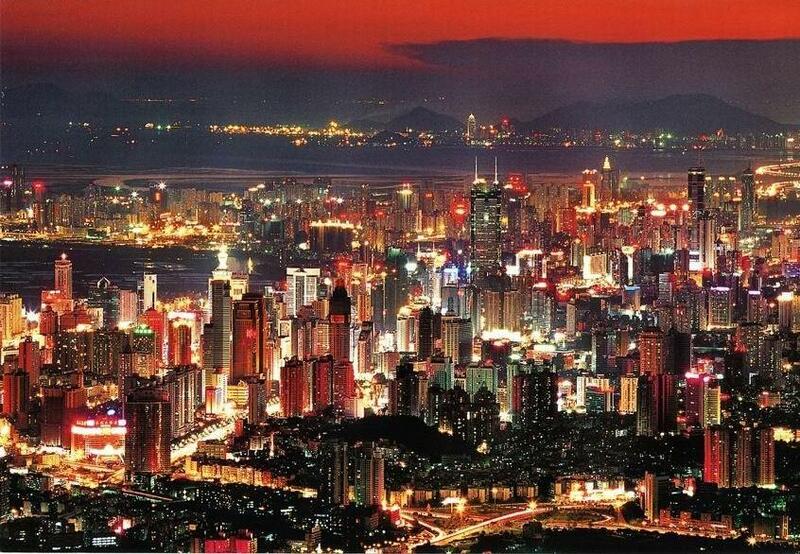 It takes time to make a city, even a city that has grown at laser speed like Shenzen. Now we face a doubly difficult challenge. First, we have to find ways to convince ourselves that we need to alter our course. Our cities have to be pointed at other patterns, other purposes. And then we must actually alter our course, and remake our urban future. Pieter Bruegel the Elder, The Tower of Babel, 1563. We humans never seem to tire of imagining and constructing the next city, searching for an ideal home. For millennia we have conjured up cities of intent – urban places that we have designed to represent certain purposes. These intended cities fall into one of at least three categories. First there have been cities imagined to serve religious purposes: a Buelah land, a new Eden, a sheltering enclave. Babel, on a plain in the land of Shinar, was such a place. As was 18th century Ephrata in Pennsylvania, or 19th century Nauvoo, Joseph Smith’s city on the banks of the Mississippi in Illinois. 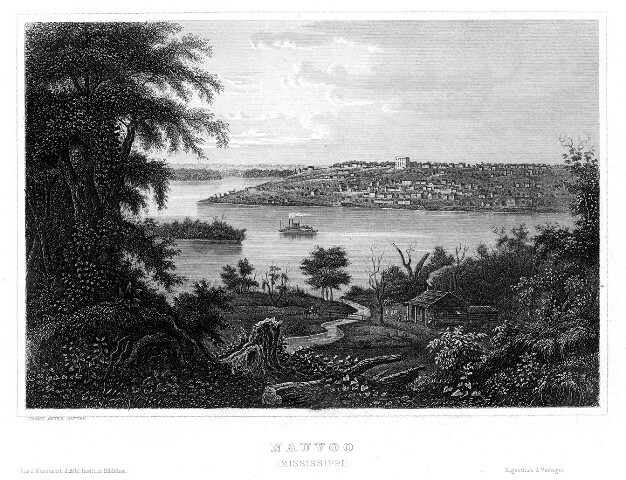 Nauvoo, Illinois, a Mormon city. At other times we have imagined next cities to serve social aims. 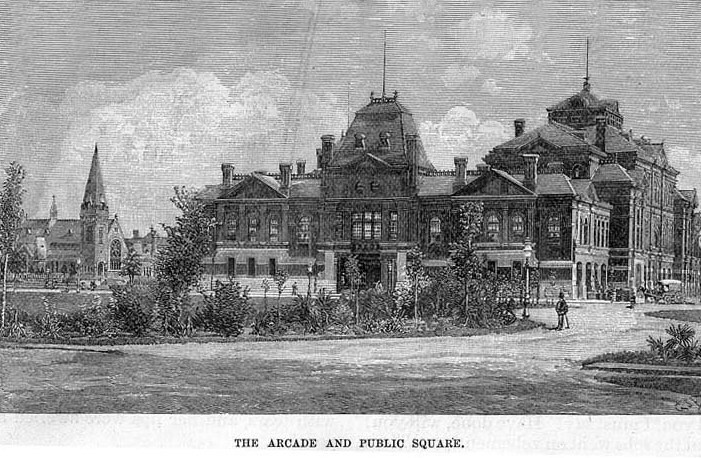 Some examples might include George Pullman’s oppressive company town of Pullman, now a part of Chicago, Ebenezer Howard’s Garden City, imagined as a counterweight to the increasingly brutish 19th century cities of Britain, or perhaps even Paolo Soleri’s Arcosanti outside of Phoenix. A third category might include cities intended to serve political purposes. L’Enfant’s plan for Washington, D.C. is a good example, as capital to a newborn democracy. And here we could include Niemeyer’s Brasilia, Walter Burley Griffin’s Canberra in Australia, Lutyen’s Imperialist New Delhi, Corbusier’s Chandigarh in India, or Louis Kahn’s work in Bangladesh. 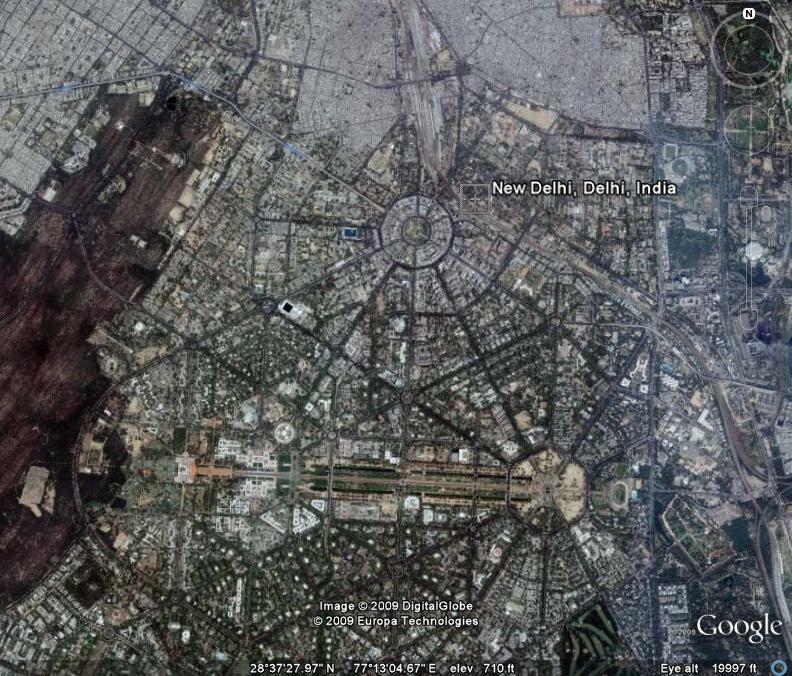 Lutyen’s New Delhi, from 20,000 feet. The lists of cities and towns in each of these three categories is very, very long. I have kept my copy of John Reps’ indispensable “Town Planning in Frontier America” by my side these last several days, and I have read of an endless number of North American cities that have their origins in a desire to create a perfect new community in a new and ‘untamed’ landscape. It’s interesting that so many of these places have actually turned out to be failures. 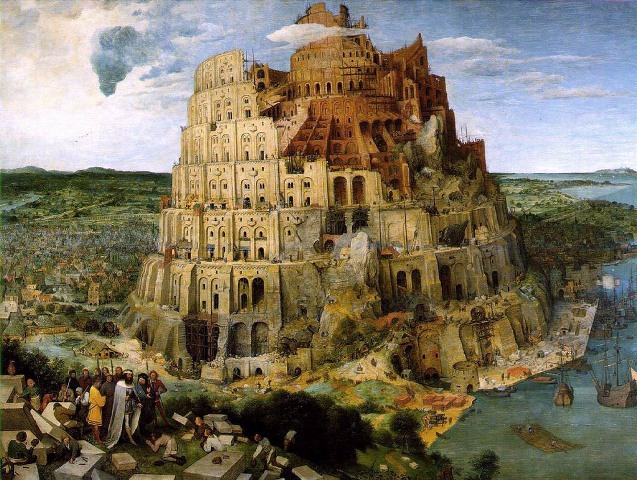 Babel had The Lord as it’s principal critic, and terminator. Pullman had his riots. Nauvoo was attacked by suspicious neighbors, and abandoned overnight, literally. The work of imagining and constructing a durable new city turns out, not surprisingly, to be pretty difficult. All sorts of places have made a claim to being ideal next places: Amana, East Aurora in upstate New York, Beijing, St. Petersburg, Teotihuacan, Levittown, Seaside. Whether commune, capital, or cottage colony, each is a powerful narrative of what concerns us most, what we value, “what matters (most) to us,” as philosopher Alain de Botton has said. We may not like what some of these places say, but their messages are crisp and clear. And many of these cities and towns were imagined as antidotes, or as I have said, counterweights, to the perceived or real tyrannies of their moments. 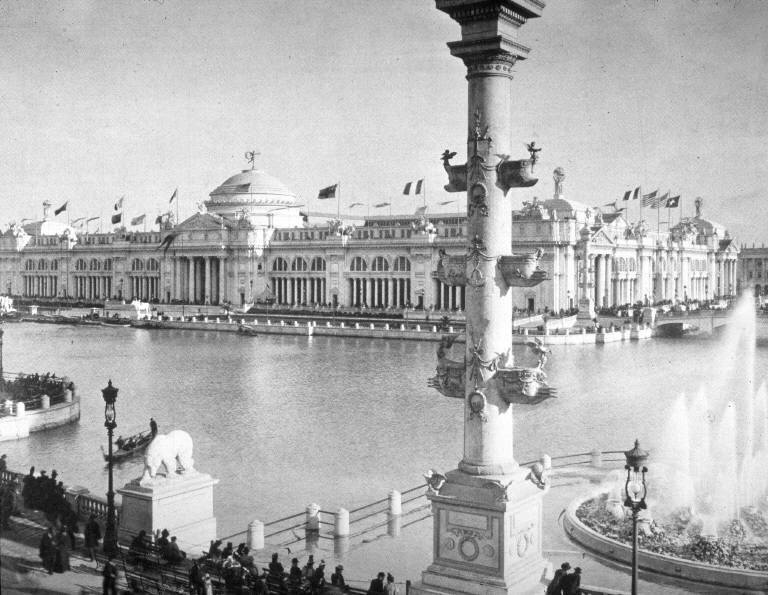 Perhaps the best example of this is The White City, the 1893 World’s Columbian Exposition, created by Daniel Burnham et. al. as an antidote to the utter chaos of late 19th century wild west American urbanism, in no-holds-barred Chicago. 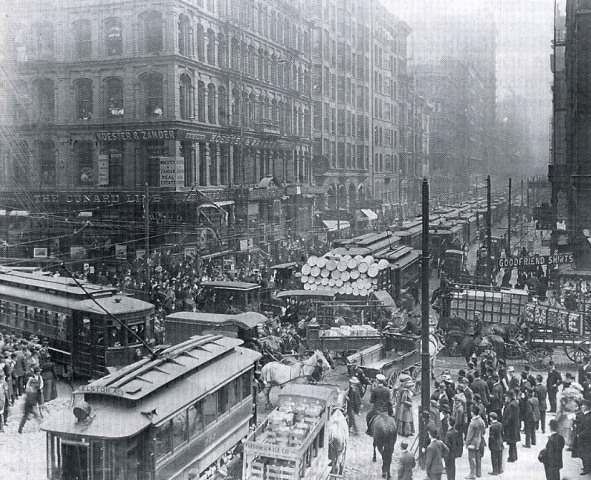 Chaotic Chicago, just after the Fair, and just before Burnham’s Plan, 1909. The White City, Chicago, 1893. And now? Now we face a new set of challenges as we dream of the next city. 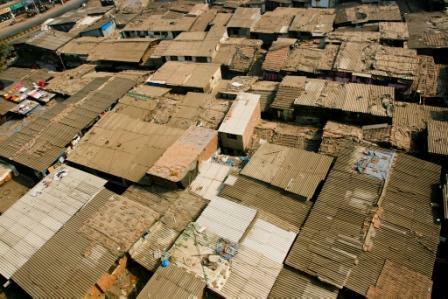 Scarcity, shortages, shifting climate and soaring populations are new and urgent urban determinants. These are the purposes to which we must now bend the city. Some of the cities I have mentioned, and many I have not mentioned, failed because their environments collapsed. (Take a look at Jared Diamond’s extraordinary book, “Collapse,” a review of cities and societies that failed because of fundamental misunderstandings of their environments). But almost none of these places was designed based on the facts of finite and shrinking resources, or too many citizens. As an architect, historian, and urbanist, I doubt that we can reshape our cities quickly enough to meet these new challenges. I am decidedly not an evironmental scientist, but I can easily sense that our society’s awareness of what lies ahead, and our willingness to act, is insufficient to the fate that is hurtling at us at a meteoric rate. Our library here is filled with books by distinguished scholars, scientists, economists, and urbanists who try to exhort us to change our patterns of urban living. Some of these authors avow optimism about our ability to do what needs to be done to construct a sustainable and durable urban future. It all sounds like whistling in the dark to me. We have been Letting Us Build Us a City for eons, never suspecting that finally time would run out on our ability to build in ignorance of consequences for a wider world. How quickly can we untangle a mess so long in the making? A decade? Two decades? We live in a neighborhood here in Washington that is teeming with tiny children. We often wonder about the city these kids will leave their grandchildren, 3 generations on. Maybe some of them will discover the antidote to the last dozen generations of dead-end urbanism. 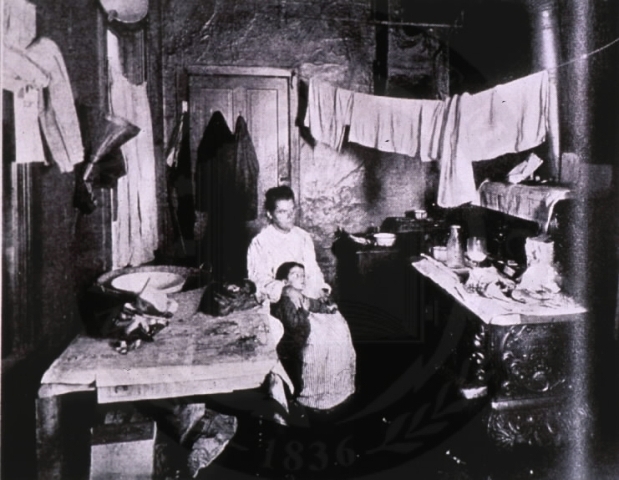 Life in a 19th century New York Tenement. I am getting a bit roughed up here on issues related to the need for increased density in the next city. Friends, colleagues, even siblings are suggesting that my recent proposals to use existing rights-of-way (streets, alleys) as sites for new construction illustrate that I am a slap-happy historic homewrecker gleefully headed back to the miserably teeming tenements of the 19th century. Okay then. I have in recent posts (in fact in many of the posts here over the last year or so) advocated a substantial increase in density as a way of increasing urban walkability, and access to a much broader mixture of uses, goods and services in nodal neighborhoods of a mile or two in diameter, connected to one another by geometrically increased transit options. I believe that a substantial increase in density enables and induces a host of urgently needed changes in the way we organize and inhabit our cities: new kinds of infrastructure to deliver and distribute energy, water, mobility and food, in radically revised and enhanced fashion. 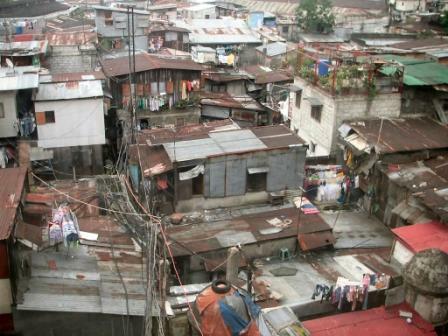 While I find much that is admirable and valid about slums from a variety of points of view, I am certainly not advocating this form of construction for Washington or Chicago or Denver (though the burgeoning tent city in Sacramento comes eerily closer to these images). Some readers have asked me to make the suburbs more dense first – to stop fussing with existing, even historic urban quarters, and to go out to the land of shopping malls and quarter acre lots. Fine. I guess I have always taken that as a given. The house where I grew up, now altered almost beyond recognition, sits in a Chicago suburb made possible by cars. The house where I grew up. So – no cars, now what? I will leave rethinking the suburbs to another moment, but I do note that this pattern of auto-dominated human settlement is doomed, Chevy Volt notwithstanding. 3,000 pound personal transportation devices are officially obsolete. Instead, I believe that there are perfectly livable, in fact highly attractive, examples of the good urban life lived in close quarters: dense, mixed use neighborhoods (much more dense than most, though not all, US cities). That seems to be a central issue with my critics – livability. Which seems to be equated with how close buildings are to one another, somehow. I have shown these images often, but here’s a rerun of a few. Note that most of the buildings are not more than 6 or 7 stories, they are quite close together (often less than 20 or 30 feet apart), and they are not miserable tenements, but instead interesting, dense, mixed use urban places. Oh, and take a look at the fact that in most of these images the neighborhoods have been altered, adjusted, and added to over time. Most feature new and old in close juxtaposition. So here goes. Gijon, Santa Cruz, Lisbon, Barcelona, Lisbon, Barcelona, Funchal, Cadiz, New York. Dense. Not too tall. Close together – or very close. Changing and aggregating over time. Lots of mixed uses. Not slums or tenements. Interesting, textured, rich places. Jacob Riis indeed – add a few bio-swales and were ready to go, right? Knowing that the city must become more populous in order to serve our future needs, what would you propose to do to increase density while preserving character? Reader Mackenzie Keast, an urbanist in Hamilton, Ontario, has encouraged me to look at developments in Vancouver and Toronto aimed at pumping up the density in the very neighborhoods I have just described. And what they are creating is pretty interesting. Don’t have an alley? No problem. 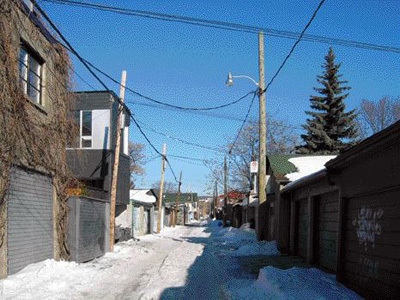 Build the unit above, or in lieu of, your garage, and use the driveway as your laneway. This is not exactly a revolutionary idea. New urbanists have been talking about this for a long time, calling the units ‘mother-in-law apartments,’ or live/work suites. But cities have been slow to warm to the idea – and even now there is some controversy swirling in Vancouver. Will these units create a “second class” of residents? Will the units affect property values? Will the units simply generate more noise and more strain on local public resources like parks and schools? Support, though, is strongly in favor of trying this approach, as a part of what Vancouver calls its “EcoDensity” plan. Another part of this plan is focusing on repaving residential streets, providing them with center strips of permeable paving and “vegetated shoulders” coupled with storm water management systems. Vancouverites are pushing hard to prepare their city for a useable, sustainable future – as a body politic they seem to be quite far ahead of the rest of us. You can check out the EcoDensity plan at www.vancouver-ecodensity.ca. Interesting stuff. Portland bioswale in the sidewalk zone. Photo sitephocus. I digress. It’s interesting to troll for strategies for increasing the density of our cities, even in places where density is absent. Something to ponder a bit further. Other ideas? A postscript: today, 16 months almost to the day after we began A Town Square, we are proud to have welcomed our 10,000th visitor. Our many thanks for your interest, and for joining us in conversations about where we live. And now, with one single image, I will annoy whole cadres of folks, even more than I usually do. I am confident that all of my lifelong historic preservation friends will throw their hands in the air in horror. And my brother Doug, an astute urbanist with a terrific eye, and ear, for what counts in city life will no doubt remain unconvinced. Nonetheless, onward. Recapping assumptions, the next city must be dense, and walkable – much more so in both categories than most US cities today. The next city cannot come at the expense of what we have already constructed – we can’t afford to throw anything away. The next city must be in contact with the valuable urban traditions of its locale. The next city must be improvisational, taking advantage of found circumstances to create places of value. Yes, that’s the dome of the Capitol in the distance. I am standing in the middle of Maryland Avenue NE, looking southwest. D Street, on the right, where the streetcar ran in the old days, is now closed. Sidewalks on both sides of the street are wider, adjacent to new construction in the right-of-way that is about 24′ in width. 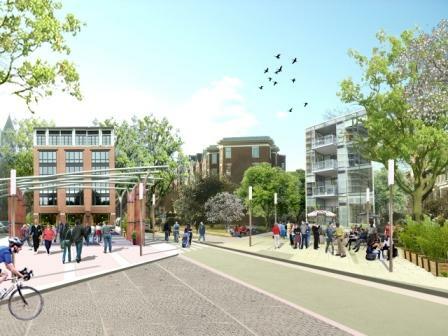 Each proposed building is about 60′ long or so – each is not continuous in its length, but instead features a small plaza between it and adjacent new construction. 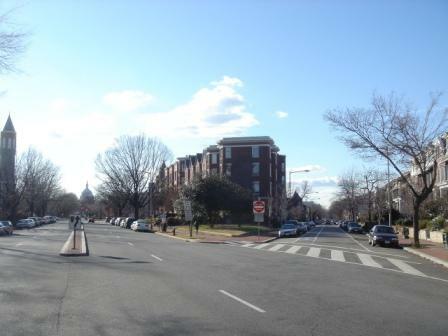 Maryland Avenue, on the left, retains one driving lane in each direction (from which the dome of the Capitol remains completely visible). In the existing condition, there is something like 160′ from face to face of buildings on either side of the street, so there’s plenty of room for new construction of about 26′ in width, plus plenty of sidewalks and open spaces. As with D Street, the buildings are discontinuous. The intersection of D and Maryland is retained as public open space. It could be a porous surface of pavers, as shown here, or planted. 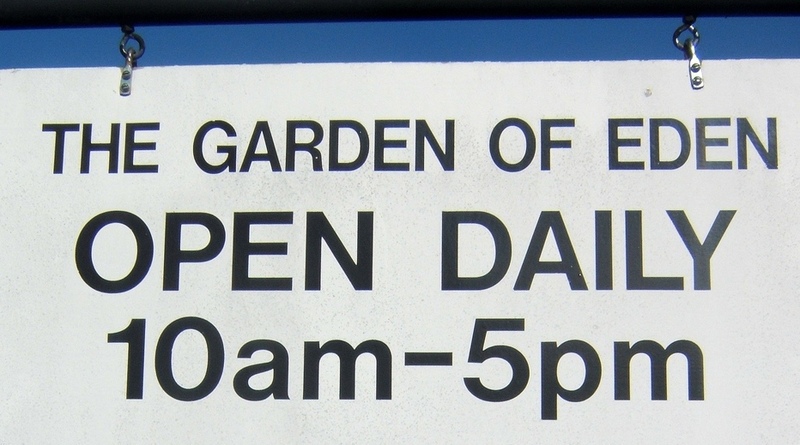 Or even gardens. Haven’t got that far yet. Oh, and the architecture: if it doesn’t look green enough, or traditional enough, or sufficiently contemporary, fine – we’ll change it. For me this is about incrementally making existing urban places more dense, more walkable, and ultimately more durable and sustainable. Density in the neighborhood has now doubled, at least. Now there will be more space for residents, and places to work, with shops or offices or units at the first floor, and units above. We can stroll out our door to the new market, or cafe, or sit and have a cold one in one of the new plazas. Okay, so let me have it. End note: my many, many thanks to true-blue friend and colleague Prashant Salvi for working up this image. Hey Prashant – I’ve got ideas for a bunch more of these….